This is one of my favourite stamp sets! I love the clean lines of the flowers and the sentiments are just fantastic and positive. This is a card for a friend who has a birthday coming and she is pretty amazing :). 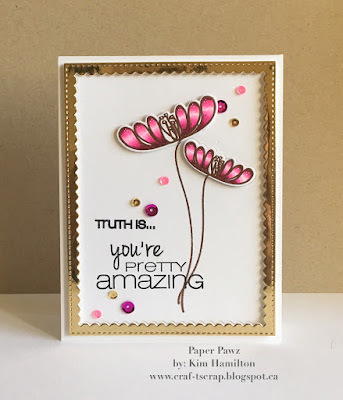 I stamped the flowers from Truth Is in Versamark ink and used my copper embossing powder. I Copic coloured the flowers using RV02, RV06 and RV69 then a little white detail with my Gellyroller. I so wish I had the MFT Copper paper for the frame! That paper is on my wish list! I ended up using gold for the frame and it worked out well. 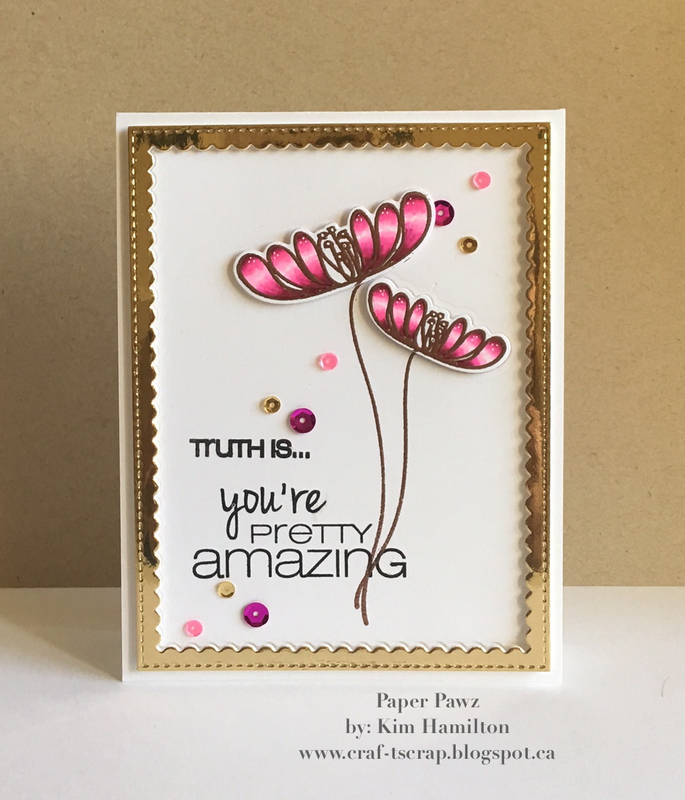 I stamped the sentiment in Versafine black and added some Pretty Pink Posh sequins. The Happy Birthday sentiment is on the inside. Quiet Saturday! Love those :) I picked up some of the new MFT stamps and dies last week so I felt like playing along with the current MFT Color Challenge. I used the Fly-By Friends stamp set, what a happy springy set so the colours in the challenge were such fun to use. I copic coloured the Daisies with Y11, Y21 and Y17, the leaves with YG21, YG23 and YG17. For the butterfly I used a mix of BG11, BG13, BG49 (inside wings) and I used B00, B01 and B02 for the outside wings. Used my White Gellyroller for added detail. I stamped the grass repeatedly with Hero Arts Green Hills ink. The pattern paper I mixed with Kraft for the sentiment is MFT plaid 6 x 6 paper pad. I topped everything off with Pretty Pink Posh sequins. I haven't posted in about a week, things at work have been hectic!!! 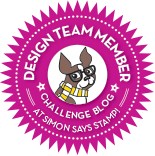 Here is a quick card I did for the current Simon Says Stamp Flickr Challenge - Ink Blending. I die cut a ballon die from masking paper and used the negative space to mask my panel. 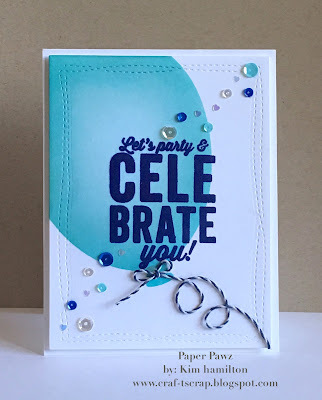 I blended Simon Says Stamp High Dive, Spring Rain and Seaglass inks for the ballon and stamped the SSS Celebrate sentiment from their Blue Violet ink. I added Lawn Fawn Navy Twine on the end of the ballon with a bit of Ranger Matt Medium to shape and stick it down. Finished off the card with a mix of Pretty Pink Posh Sequins and Martha Stewart Heart Sequins. I was so excited to get my hands on this new stamp set by Hero Arts! I really love their new release and this set is one of my favourites! I am not one to use purple often but I decided to experiment. The lines on this flower inspired me to break out my Copics (V12, V04, V06 and V09 - Flower YG21, YG25 and YG17 leaves) and just colour! 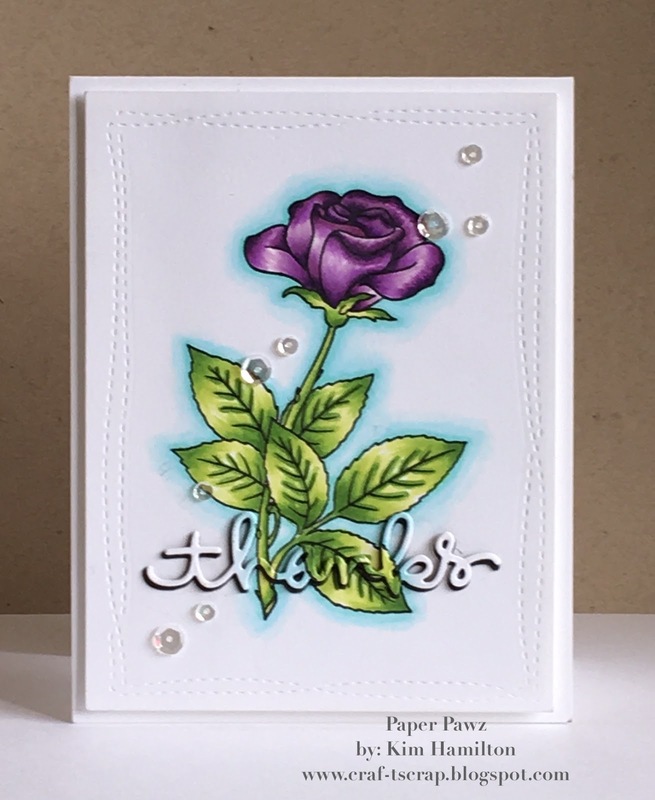 I liked the way it turned out and I didn't want to take away from the flower so I die cut my Simon Says Stamp Thanks sentiment from the panel itself and added four extra layers in black to give it height and to offset the original "thanks" . I finished it off with my favourite Pretty Pink Posh sequins. 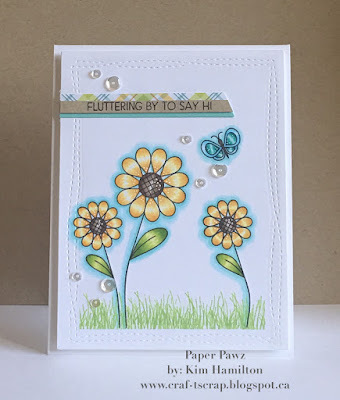 The current Simon Says Stamp Challenge over at Flickr is Spring! So funny because they are announcing 10 plus cm of snow here in Montreal! Ugh! 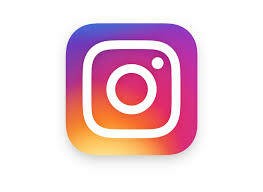 So as you can see, my inspiration for spring are flowers, colour and gold for the sun! I used the Simon Says Stamp Flower Friend stamp set with Ranger gold embossing powder for the background. I then masked off a rectangle in the centre and used Abandoned Coral and Picked Raspberry Distress Inks. I cut multiple SSS Hello dies in black and glued them together, I then felt there was missing something so I cut an MFT gold frame. I white embossed the Friend sentiment also from the Flower Friend set and I glued the "hello" to the top and placed it on top of the frame! Finished off with a mix of Pretty Pink Posh sequins. I pulled out this Penny Black woodblock stamp called Promise Me to practice my watercolour. 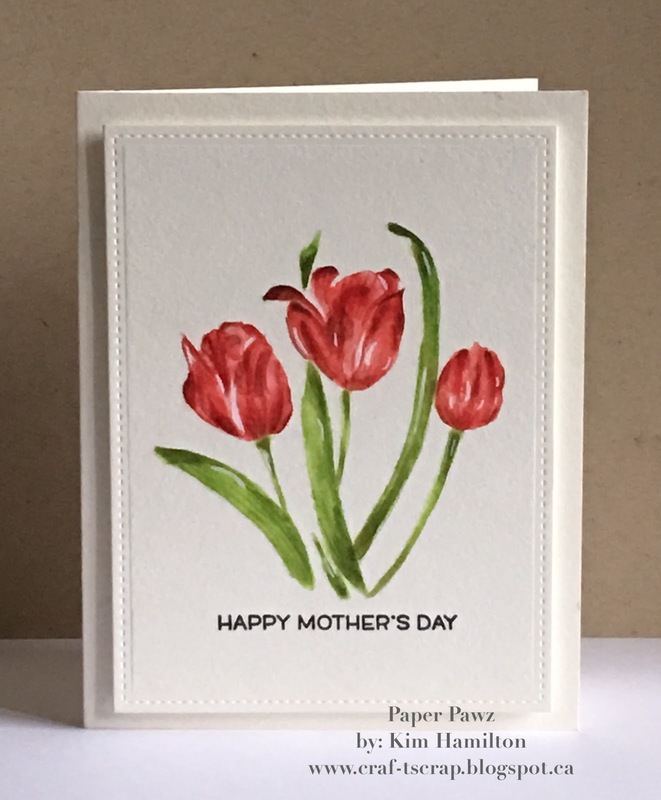 I don't know what it is about Penny Black Stamps... Every year I use one of the PB flowers for something and it inevitably becomes my own Mom's Mother's Day card! It has been four years and I have a feeling the tradition may continue! I love the watercolour effect but I seem to struggle, so I have been forcing myself outside my zone to practice. I really loved the way this one turned out. I used my Tim Holtz Ditress Markers for this one. I coloured directly on the flower and stems using Abandoned Coral and Candied Apple for the flowers then Twisted Citron and Mowed Lawn for the stems. I didn't cover the stamp completely, I used the paler colours for the outlines (again sparingly) and the darker colours for the highlights. I sprayed the stamp with my sprayer about three times then stamped it on my Canson Watercolour paper. I smoothed out the pigment and then went in to add highlights with the Fired Brick for the Flowers and Peeled Paint for the stems. I used a little White Gellroller pen for added white highlights.